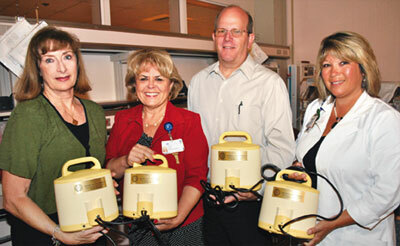 Holding four of the five new breast pumps purchased for the NICU are Cordelia Rotary Past President Nancy Garver, current President Colleen Knight, neonatologist Dr. Walter Berkheimer and lactation consultant Cindy Stade, R.N. New mothers with premature or critically ill infants being cared for in NorthBay Medical Center’s Newborn Intensive Care Unit (NICU) have one less thing to worry about, thanks to a generous donation by the Rotary Club of Cordelia. The Rotary Club of Cordelia donated five Medela brand breast pumps, which will allow the new moms to continue feeding their babies even though the moms have been discharged. NorthBay Medical Center’s NICU cares for as many as 250 premature and critically ill infants each year, according to Deb Thorson, director of Women’s and Children’s Services for NorthBay Healthcare. “The long-term health benefits of having a mother be able to feed her baby breast milk are tremendous,” she notes. The Rotary Club of Cordelia has been a long-time supporter of NorthBay’s Pediatric programs, according to Colleen Knight, executive assistant with NorthBay Healthcare Foundation and president of the club. During the past 20 years, the local group has donated more than $200,000, and this year’s $8,500 donation toward the purchase of these breast pumps “is important because it helps the new moms give their babies a good start. “The ability to help create healthy families is a universal cause and one that Rotary supports,” says Nancy Garver, Rotary Club of Cordelia past president. A portion of the funds for the pumps was raised during the Rotary Club of Cordelia’s annual Spring Extravaganza event. The remaining funds were obtained through a Rotary International District grant, which was pursued by Candy Pierce, past District 5160 Rotary Governor and member of the NorthBay Healthcare Foundation Board of Directors. Because Medela offered special pricing on the pumps, the group was able to purchase five instead of four.